Let's suppose that you have a situation where you are receiving an XML document from a foreign client. For example, they have encoding="CP874" (Thai charset) in the XML declaration. This XML file is going to be placed into MS SQL 2005 table with an XML datatype column. 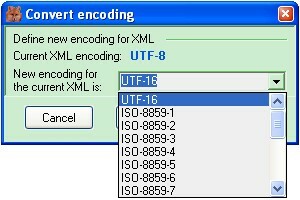 It is a fact that the XML in SQL stores all data as UTF-16. So, first you have to convert the incoming XML into UTF-16. You can open the file in XMLFox Advance interface and change the encoding and save it. It is easy enough. UTF-8 and UTF-16 are two encoding schemas of Unicode. UTF stands for Unicode Transformation Format. There are various types of UTFs. They are simply different way map the Unicode code-points to a digital representation. If an XML document does not have any encoding declaration, (and no external encoding declaration mechanism such as the HTTP header is available), the assumed encoding of an XML document is UTF-8. The values for the encoding declarations are the charset name defined by the IANA (Internet Assigned Numbers Authority). To accomplish the XML encoding conversion we will use XMLFox Advance that is a useful XML and XSD schema editor. XMLFox Advance XML editor allows you to specify the encoding of the document when creating and saving it. Also you can use one of the encoding conversion provided within XMLFox Advance interface.